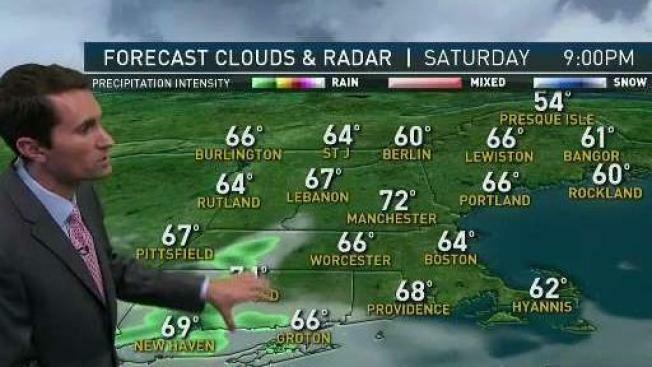 Saturday: Mostly cloudy, spot shower. Highs in the 70s. Saturday Night: Mostly clear. Lows in the 40s and 50s. Sunday: Mostly sunny. Highs in the 60s to near 70. Although still muggy this morning for much of New England, a cold front is moving in from north to south. That front will bring more refreshing air in by day’s end. The cooler, less humid air arrives with sunshine this morning in Northern New England. In Southern New England the drop takes until afternoon, and it will come with some scattered showers and thunderstorms. By this evening sunshine will be quite widespread, leading us into a beautiful night. Unlike last night it’ll be very refreshing and crisp, making for nice sleeping with the windows open. Lows will land in the 40s and 50s. Sunday brings tons of sunshine, but cool conditions. Highs will be around 60 at the coast with a stiff easterly breeze. Inland we’ll climb into the 70s. Monday and Tuesday are even cooler with 50s and 60s for highs. We’ll also have periods of rain that will stretch into mid-week. We dry out somewhat late week as temperatures rebound back into the 70s.